We’re a luxury pet resort that offers cage-free boarding, daycare, training, and more. 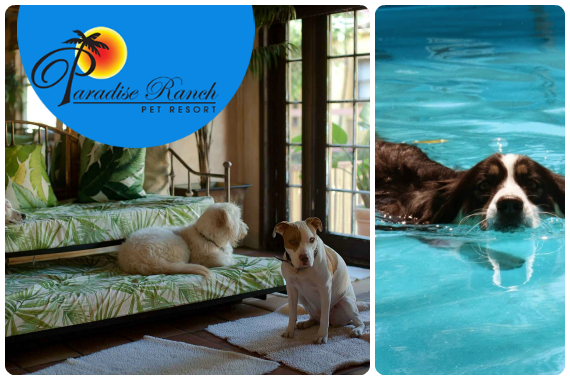 Paradise Ranch Pet Resort has been pampering SoCal pooches since 1997! "Our services know how to turn heads!" "Make your memories with us last furrever. http://bit.ly/24MdMoB"
Take our Jack there everytime we go on vacation. I'm surprised he ever wants to leave there. We're able to monitor on cameras. He always looks like he's having a great time. We love bringing our dog Spoon to Paradise Ranch for daycare and especially for boarding. The facility is large so the dogs never get claustrophobic, and the employees are top-notch trainers. It’s the best place ever! Yes, I'd like to receive news from Paradise Ranch Pet Resort. Sign up for the Paradise Ranch Pet Resort Newsletter!